We’d love your help. Let us know what’s wrong with this preview of Il postumano. 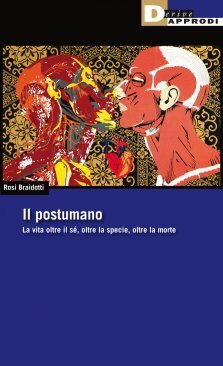 La vita oltre l'individuo, oltre la specie, oltre la morte by Rosi Braidotti. To ask other readers questions about Il postumano. La vita oltre l'individuo, oltre la specie, oltre la morte, please sign up. This book is not, in any straightforward sense, about "the posthuman" in the sense that futurists like Ray Kurzweil and many science fiction authors use the term. That is, it's not a discussion of the ways by which future technologies might enhance and modify human minds and bodies to the point that the definition of "human" is called into question. Rather, it's a book of dense, highly specialized philosophy. The branch of philosophy it discusses is tangentially connected to the "posthuman" in th This book is not, in any straightforward sense, about "the posthuman" in the sense that futurists like Ray Kurzweil and many science fiction authors use the term. That is, it's not a discussion of the ways by which future technologies might enhance and modify human minds and bodies to the point that the definition of "human" is called into question. Rather, it's a book of dense, highly specialized philosophy. The branch of philosophy it discusses is tangentially connected to the "posthuman" in the sense described above, but only tangentially. This philosophy seeks to develop a successor to "humanism" as a philosophy, hence "posthumanism" (which would have been a better-advised title for this book). Posthumanism, or "Posthuman Theory" is allied to the field of Critical Theory, which is noted for its esotericism, its cryptic jargon, and, in the view of some, its navel-gazing insularity and detachment from real-world and common-sense concerns. Part of the book is the best review of contemporary social theory I have seen recently. Some sections of the boook discusses the state of humanities and academia/universities. This is also revealing. Posthumanism discussion is a peculiar one that has nothing to do with futurologists etc. Since i come from a poststructuralist background like the author, i find her perspective even more helpful. A tak poważnie, Braidotti, jak zawsze, oferuje klarowne, wyczerpujące i wciągające kompendium myśli posthumanistycznej, rozumianej jako okres koniecznej i możliwej reformacji sposobów konstruowania i rozumienia podmiotowości. "Po człowieku" to przegląd możliwości i zagrożeń nowoczesnego myślenia, nie tylko tych związanych z bigoteryjnym konserwatyzmem, ale też tkwiących w sercu (post)humanizmu, jak androcentryczne nawyki myślowej i kierowanie się kapitalistyczną logiką. Wyjątkowo interesująca interpretacja Spinozy. W sumie to dobry punkt wyjścia przed sięgnięciem po najnowszą książkę Haraway. When I picked this book up I thought it was a philosophy of science text about posthumanism, so keep that in mind when you read this review. I hate reading most postmodern philosophy, and was appalled to discover that this was a postmodern text. As I began to wade into it I found the introduction to be not so bad and found myself agreeing with it more than I thought I would. That was short lived. This "philosophy" involves Braidotti citing her opinion on something and then citing somebody else When I picked this book up I thought it was a philosophy of science text about posthumanism, so keep that in mind when you read this review. I hate reading most postmodern philosophy, and was appalled to discover that this was a postmodern text. As I began to wade into it I found the introduction to be not so bad and found myself agreeing with it more than I thought I would. That was short lived. This is an over-long Dean's Address in which all the different bits of news she's heard over the past year get a brief mention, but nothing is explained in any detail. The primary concern is institutional: to emphasise that "the Humanities" have a viable future in the western university structure of the 21st century. Since the later decades of the 20th century saw Humanities departments become dominated by theorists who rejected the traditional presumptions that led to the emergence of "the Huma This is an over-long Dean's Address in which all the different bits of news she's heard over the past year get a brief mention, but nothing is explained in any detail. The primary concern is institutional: to emphasise that "the Humanities" have a viable future in the western university structure of the 21st century. Since the later decades of the 20th century saw Humanities departments become dominated by theorists who rejected the traditional presumptions that led to the emergence of "the Humanities" in the first place, there is going to be a problem of justification. The option of simply declaring that Shakespeare &co. possessed universal human truths inaccessible to science is not available to anyone who rejects "elitism". There is constant recourse in this book to statements about what "we" think and feel about various matters. Braidotti shows a fleeting awareness that this is, to put it mildly, problematic (pg. 83), but this doesn't seem to stop her. It's easy to work out who "we" are - "we" are all inhabitants of the typical western Humanities faculty. We have cartoonish, undetailed ideas of intellectual history, we only read a subset of philosophers identified as "continental", we misidentify assertion as argument, we have a fidgety concern for "progressive politics" but cannot relate it to the sceptical views we endorse as a matter of professional duty, we are worried that the neoliberals are going to close the whole game down sooner or later. We only acknowledge thinkers outside our world as a strained courtesy, or as hate-figures. For example, Martha Nussbaum gets 1 page of notice, that barely tells us anything about what she thinks and how she argues for it, before she is handwaved away. The topic of "post-humanism" is a serious and fascinating one, in both the dimensions gestured at here. Firstly, how anyone who takes Foucault's position seriously can reconcile it with progressive politics. That's a topic plenty of other people outside "critical theory" have wondered at, for example Alasdair MacIntyre in "Three Rival Versions Of Moral Enquiry". There has never been any shortage of conservative, reactionary responses to Enlightenment humanism and liberal theory. Secondly, we (and I mean everyone) have to consider how new technological changes will alter our assumptions about human possibilities. This is also not a new problem: the improvements in modern medicine, raising life expectancies and diminishing infant mortality (in the rich countries, at least) have themselves caused a great many social and cultural changes. Why worry about God and redemption if death is far over the horizon? The issues are: equity in how the benefits are fairly distributed, and how society would have to change if (just maybe) everyone could live to be 500, and severed limbs can be regrown or reattached painlessly and quickly. An older kind of progressive, non-academic and more popular, such as Shaw and Wells, did a lot of thinking on this, but the crit. theory crowd seem to just want to organise the same old seminars under different terminology. The proof-reading of this text seems to have been neglected. Spellings of names vary, and also vary from their standard version ("Socal" for "Sokal"). On pg. 157 "A new relationship between arts and sciences is being established before our very, but the question is..." - I think "eyes" is missing before the comma there. Of course shoddy proofing seems to be normal amongst commercial publishing nowadays, but it's not great in a book that presents itself as a manifesto for the survival of serious work in a shallow culture. Excellent text, dealing with the phenomenon of the "posthuman". Braidotti's four chapters focus on: 1. A genealogy of the path towards posthumanism. Beginning with the classical understanding as "man as the measure of all" or the renaissance Vitruvian man. Towards crisis of "man" in anti-humanism, which sub verses this understanding of "man" as the measure of all things by introducing difference and the minoritarian. This ultimately culminated in the posthuman, which exist when that understandin Excellent text, dealing with the phenomenon of the "posthuman". Braidotti's four chapters focus on: 1. A genealogy of the path towards posthumanism. Beginning with the classical understanding as "man as the measure of all" or the renaissance Vitruvian man. Towards crisis of "man" in anti-humanism, which sub verses this understanding of "man" as the measure of all things by introducing difference and the minoritarian. This ultimately culminated in the posthuman, which exist when that understanding of "Human" has been discarded. The hegemonic, or universalizing conception of human is gone, and what is left is something posthuman. 2. The second chapter travels through 3 plateaus in order to understand where "human" left the picture. The first is the "becoming-animal", which looks at how the distinction between "man" and "animal" is distorted through the recognition of difference, and the bio-genetic structure of advanced capitalism which treats minority groups and animals as commodities. This moves into the becoming-earth which criticizes deep ecology, but looks through the lens of Spinoza's radical immanence, and an affirmative approach to "zoe" – which is life. The "human" is simply a part of "Nature" or "God", and not different from these things. Simply in the multiplicity. Third, a look at becoming-machine which occurs somewhat through advanced bio-capitalism (which reduces bodies to carriers of vital information, thus rendering them similar to machines). This leads Braidotti to a zoe-centred egalitarianism as the new ethic that ought to emerge and replace a rights-centred approach (which is humanistic). An emphasis on zoe and life will love to a new, affirmative approach. End the hierarchy and develop a new understanding of life. This will lead to new conceptions, new thoughts, new movements, etc. 3. The third chapter deals with what Braidotti calls a "necro-politics". This looks at conceptions of death through the post-human view. A look at how we interact with death, and how technology interacts with death. In the end, Braidotti settles somewhere in the line of thinking that if we transform our understanding to fit with "zoe" or Spinoza's "radical immanence" that death simply becomes a part of life, that death is a part of "zoe", and that the individual is removed. Out of this, they posit that a new ethics of posthuman should emerge, which locates in open access, open government, and collaborative ethics. 4. The fourth chapter deals with the humanities, and where they should move after the death of the "human"– the thing which grounds their epistemology. Braidotti suggests that it move towards a less rigid conception of itself. Embrace the studies within it, and become a study of the posthuman. 1. Posthuman subjectivity. Not postmodern/poststructuralist, but rather a nomadic subject which is materialistic, embodied and embedded in zoe, in the radical immanence/politics of location. LIfe is not metaphysical for this subject, it is not semiotic. It is a multiplicity of actions, of doing. 2. Posthuman ethics. A non-unitary ethics. An ethics with community of interdependence. A notion of ethics which flows out of Nietzsche/Deleuze, with a focus on relationality and creativity. At the same time a focus on "open source" and "open access" and "collaboration"
3. Affirmative Politics. Again, aimed at the collective, with inter-accountability. With a fully immersed and embodied subject in the zoe. 4. Posthuman all too human. A move towards the future of cyborgs. Should we be reactive or proactive. It's not clear where we are going, but how should we understand subjectivity in this future. Off the bat: the two stars stand for the official goodreads scale ('It was OK'). The book starts of very well. The first two chapters Are interesting, although not very innovative. We actually get only a handful of original ideas, relying mostly on postulates that have been around since the mid-20th century, some even earlier. The rejection of the outdated Enlightenment model is a compelling idea, as are the changes discussed in the second chapter. The following two chapters are, unfortunately, l Off the bat: the two stars stand for the official goodreads scale ('It was OK'). The book starts of very well. The first two chapters Are interesting, although not very innovative. We actually get only a handful of original ideas, relying mostly on postulates that have been around since the mid-20th century, some even earlier. The rejection of the outdated Enlightenment model is a compelling idea, as are the changes discussed in the second chapter. The following two chapters are, unfortunately, less original and, at times, tedious. I'll start with the final chapter: it's all been said. The canon wars, the culture wars, the Sokal hoax are all old news, and, furthermore, they have been discussed at length, so a revision does not serve any purpose. Furthermore, it is ironic that she seeks a new future for the humanities in Asia, when Japan heavily cut funding all humanities and social studies departments. China, on the other hand, still has to tackle problems connected with freedom of speech. What is more, Braidotti's affirmative approach seems the see Eurocentric thinking as a globally corrupting factor. As much as I agree, she ignores that a number of other cultures have belligerent and centralizing tendencies. She is terribly zoocentric, ignoring plants, fungi, bacteria, archea, and viruses, which is problematic when postulating a new view of life as a 'transversal force' that unites all species. Furthermore, the implications of her views on death in this light are even more problematic in light of this. Her interpretation of the posthuman condition, although ostensibly mentioning its flaws, seems almost to be happy-go-lucky, as the final sentence seems to suggest. In a world of many threats to global security this seems very unconvincing. And that's ignoring the fact that the entire book bases mostly (though not solely) on white philosophers of European descent. A theoretical exploration of philosophies for posthumanism, Braidotti's book makes a case for a specific kind: a monist (Spinozist), vitalist, postanthropocentric, (antihumanist) posthumanism. With a vocabulary informed by Foucault, Deleuze and Guattari, the author shows a short, subjective presentation of humanism and of other kinds of posthumanism(s): Nussbaum's reactive, human rights based view and the techno-scientific view. Research in posthumanist times is explored, in terms of: (1) becomi A theoretical exploration of philosophies for posthumanism, Braidotti's book makes a case for a specific kind: a monist (Spinozist), vitalist, postanthropocentric, (antihumanist) posthumanism. With a vocabulary informed by Foucault, Deleuze and Guattari, the author shows a short, subjective presentation of humanism and of other kinds of posthumanism(s): Nussbaum's reactive, human rights based view and the techno-scientific view. Research in posthumanist times is explored, in terms of: (1) becoming-animal (in capitalist society all bodies are modified for consumption, animal or human), which draws inspiration from Donna Haraway, but also from such positions as Frans de Waals', with his moral research on animals; (2) becoming - earth, in topics such as Deep Ecology (which she disagrees with as she considers it interprets the world according to human egoistic progressive views); (3) becoming machine. Afterwards she argues strongly for her case, a kind of hybrid, subjective, positioned, nonlinear, critical and creative, ethical and imaginative stance towards posthumanism and the kind of humanities that should be researching it. This was my first introduction to the theory of the posthuman and it was a good place to start. Braidotti is very clear in her definitions - sometimes too clear, to the point of repeating the same thing many times over - but that certainly helped in my understanding of the subject. I agree with most of her stances and personally find the posthuman fascinating, but where I disagreed I strongly disagreed. Her using of mental illness discourse in her rhetoric is extremely offensive and greatly hampe This was my first introduction to the theory of the posthuman and it was a good place to start. Braidotti is very clear in her definitions - sometimes too clear, to the point of repeating the same thing many times over - but that certainly helped in my understanding of the subject. I agree with most of her stances and personally find the posthuman fascinating, but where I disagreed I strongly disagreed. Her using of mental illness discourse in her rhetoric is extremely offensive and greatly hampered my liking of the book. Her insistence on the affirmative is understandable, but I wasn't personally persuaded by it. I also question how practical some of her ideas are for creating a sustainable future. Best overview of Posthumanism that i've encountered. Clear, concise, and accessible. Her writing was hard to follow. I wouldn't recommend this to anyone, who has not studied philosophy. This book is an introduction to the many strands of theories of the posthuman. At the heart of the book is a call to a posthuman ethics, what she calls a “vitalist egalitarianism of zoe,” which grows out of ontological relationality and which recognizes the inter-connectedness between all living things (and spaces) without (re)centering on the self. For Braidotti, a posthuman ethics is dependent upon letting go of the (self-)centering of human (she frequently refers back to the Vetruvian Man), t This book is an introduction to the many strands of theories of the posthuman. At the heart of the book is a call to a posthuman ethics, what she calls a “vitalist egalitarianism of zoe,” which grows out of ontological relationality and which recognizes the inter-connectedness between all living things (and spaces) without (re)centering on the self. For Braidotti, a posthuman ethics is dependent upon letting go of the (self-)centering of human (she frequently refers back to the Vetruvian Man), the atomized individual, and requires a new subjectivity-formation that is “materialist and vitalist, emobodied and embedded, firmly located somewhere” (51). She seeks to build an ethics based on creativity and the opening up of possibilities, the generative capacity of living beings and spaces to overcome vulnerability. Which is not to be indifferent to human suffering, but rather, is built from an ethical bond that is process-oriented as opposed to reactive. Braidotti's book is a rare gem that is both highly accessible and deeply thought-provoking. I was reminded that it is possible to be theoretically provocative without being unreadable. At the heart of the book is an exploration of the possibilities generated by letting go of the fascination and primacy of the "human" - an idea already deeply fraught in its varied application even as it stands in opposition to, for instance, "animal." However, Braidotti’s book, although incredibly rich in philosophical history, is mostly devoid of economic critique. She occasionally mentions Marx (especially in Chapter 1, under the anti-Humanism section) and throws in an occasional nod to necro-politics and necro-political economy (particularly in Chapters 2 & 3); however, there is no sustained engagement with capitalism. Further, while she espouses a generative ethics, meaning she sees possibility and hope in suffering through a posthuman ethics, her distance from empirical engagement is made manifestly clear through her near excitement. Does the difference engendered by philosophy-at-a-distance, as opposed to grounded empirical study, make more possible this call for “ethical relation on positive grounds of joint projects and activities, not on the negative reactive grounds of shared vulnerability” (190)? Is “shared vulnerability” somehow different from recognizing precarity as part of the broader project of late-capitalism and its dependence on necro-economies? Thirdly, she is extremely focused on “human” over animal or environment, although she consistently refers to them throughout the book. The non-human life is acknowledged as central to a posthuman ethics, but the argument for their inclusion is very slight. Even as she insists that deep ecology fails because it is humanist in the way it makes nature more human-like, she simply gives nod to non-human. Even technology gets more coverage in this book than animals or environment. Finally, and much lesser, I was surprised by the heavy focus on technology that failed to address hyper-connectivity. I kept wanting to hear about how science-and-technology-driven posthumanism might be emerging from within new forms of sociality that are mediated through or via technology. It’s a glaring gap. A critic of Humanism and monist, Braidotti offers a very interesting discussion on the 'posthuman', including its integration into 'affirmative politics'. "The emphasis falls instead on issues of diversity and differences among them and on the internal fractures of each category. In this respect, anti-humanism rejects the dialectical scheme of thought, where difference or otherness played a constitutive role, marking off the sexualized other (woman), the racialized A critic of Humanism and monist, Braidotti offers a very interesting discussion on the 'posthuman', including its integration into 'affirmative politics'. "The emphasis falls instead on issues of diversity and differences among them and on the internal fractures of each category. In this respect, anti-humanism rejects the dialectical scheme of thought, where difference or otherness played a constitutive role, marking off the sexualized other (woman), the racialized other (the native) and the naturalized other (animals, the environment or earth). These others were constitutive in that they fulfilled a mirror function that confirmed the Same in His superior position ().This political economy of difference resulted in passing off entire categories of human beings as devalued and therefore disposable others: to be ‘different from’ came to mean to be ‘less than.’"
"My [Braidotti] monistic philosophy of becomings rests on the idea that matter, including the specific slice of matter that is human embodiment, is intelligent and self-organizing. This means that matter is not dialectically opposed to culture, nor to technological mediation, but continuous with them. This produces a different scheme of emancipation and a non-dialectical politics of human liberation." Nice book - I enjoyed her disclosure of influences and values as context to her research. If I could choose 3.5 stars, I would. In this text, Rosi Braidotti discusses the current state of posthumanism. While, based on the title, the book might be taken as an introductory text, instead it moves on from quite a few posthuman texts from the past decade or two (like the work done by Donna Haraway) and takes their work further to describe her own view of the posthuman. The book is very much concerned with a lack of distinction between life and death, trying to move those seemingly opposite If I could choose 3.5 stars, I would. É um livro bem mais denso do que eu esperava, mas muito informativo se você estiver disposto a aprender. Braidotti começa seu livro fazendo uma espécie de genealogia das teorias pós-humanas - ou como ela chegou ao ponto de se identificar como uma pensadora pós-humana. A seguir, ela começa a analisar alguns aspectos do pensamento pós-humanista - a relação com os animais, com o meio ambiente, com a tecnologia. Pessoalmente, eu esperava alguma análise de manifestações culturais, mas logo o livro dei É um livro bem mais denso do que eu esperava, mas muito informativo se você estiver disposto a aprender. Braidotti começa seu livro fazendo uma espécie de genealogia das teorias pós-humanas - ou como ela chegou ao ponto de se identificar como uma pensadora pós-humana. A seguir, ela começa a analisar alguns aspectos do pensamento pós-humanista - a relação com os animais, com o meio ambiente, com a tecnologia. As mediocre-ly written summations of theoretical ontologies go, this was okay. Can't help but be disappointed though. Braidotti sets up so much tingling possibility in her Introduction, but I felt like I was reading 'Beginning Theory' by Peter Barry (so it is extremely useful for a scanning). I found nothing of heft though. It's quite fantastic. Very Deleuzian, very wild. Here and there a bit "milquetoast" (thanks to Tony for that word), but overall quite wonderful. Braidotti, brilliant call to arms in the face of advanced capitalism and its consequences for the environment. Listened to a very interesting interview with the author on The Philosophers Zone podcast.